Determine your size: Use your body's measurements as a guideline for sizing. If you have a larger cup size (E+) you can go up a size to achieve a good all-over fit especially concerning the underwires. If you are uncertain of your size, please contact us before ordering. Please measure your natural waistline, and your hip across the widest part of your bum. Be sure you are measuring your hip with out jeans on, as this can add 1-2" to your measurement. 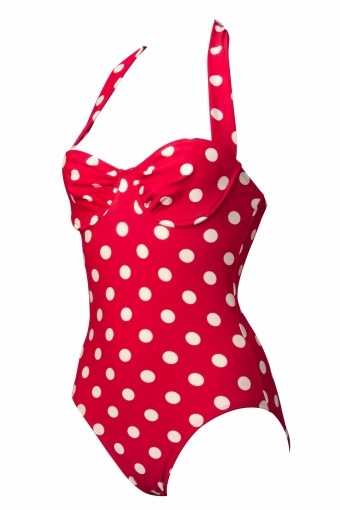 Spots Red White1 piece tie halter swimsuit from Bettie Page Swimwear. This collection is inspired by fifties pinup icon: Bettie Page 'Queen of Pin ups'. Allow yourself to be seduced by this exquisite polka dot one-piece. The sweetheart top has underwires and pleated inserts which gives you the perfect fit and support regardless your cupsize! It is made from a stretchy and comfortable quality mix of lycra and spandex. The front is lined and not see-through with adjustable halterties. The high cut leg makes your legs look longer. 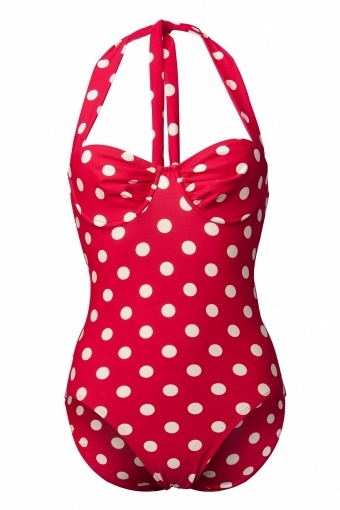 A must have swimsuit for every pin up girl!